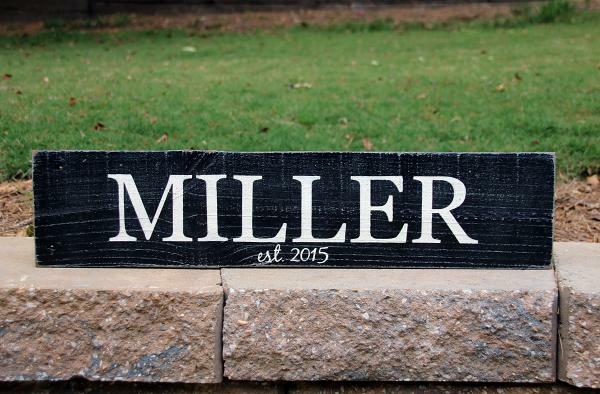 Display your family name proudly on this 2ft Personalized Last Name Sign. Painted on a substantially-sized two foot long reclaimed weathered wood board, these surname signs make an especially wonderful gift for parents, grandparents, relatives, and newlywed children--Every family needs one! 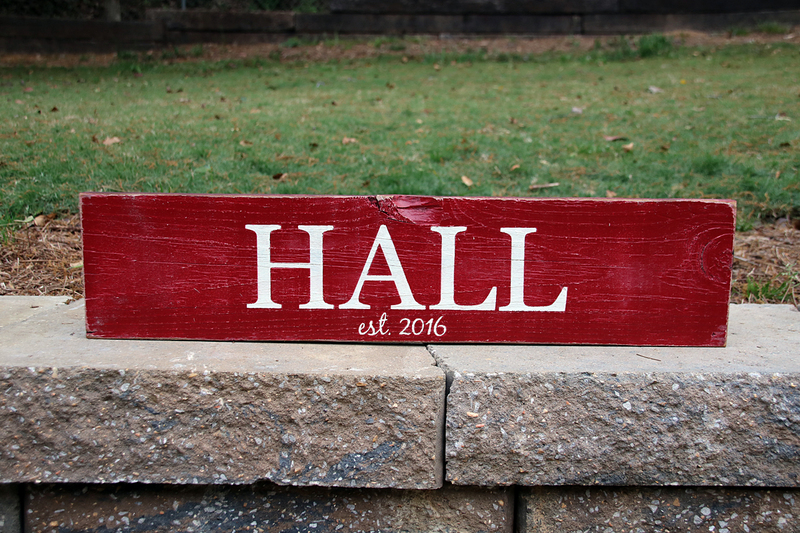 The 2ft length fits names and words up to 7 letters and is available in four color options: black, white, brown and red. Optional add-ons include the family's established year painted below the name, angled corners, or a paper overlay including each family members' first name or special family motto or quote layed over the top of the surname. 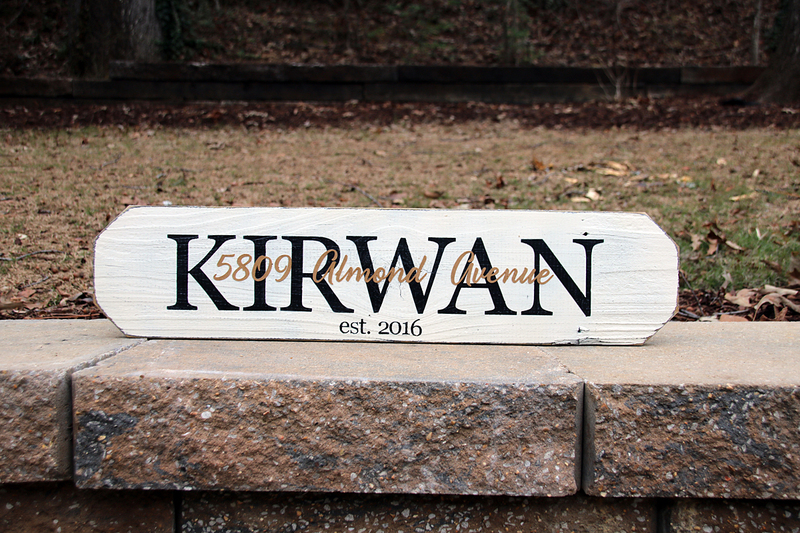 This style of sign looks especially nice hung above archways and doorways in your home. 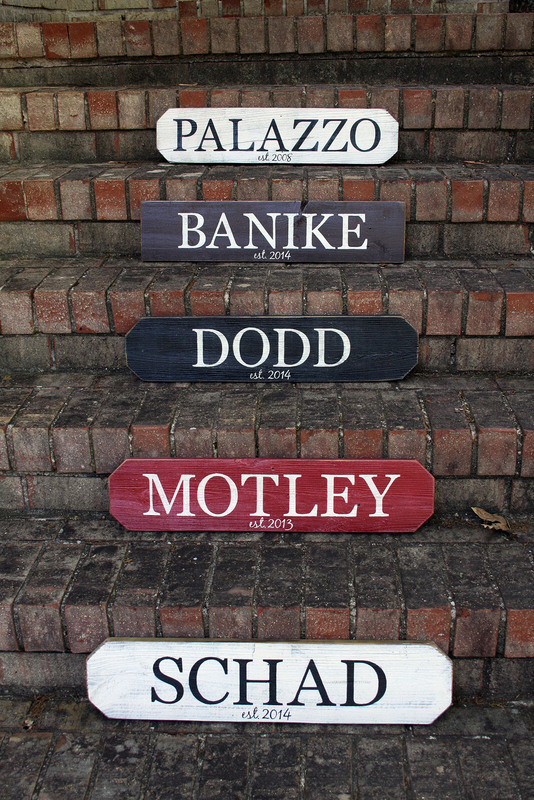 *For longer names or phrases, see the 3ft Personalized Last Name Sign option. Will the letters be Uppercase or Lowercase? All names will be painted in all uppercase letters. 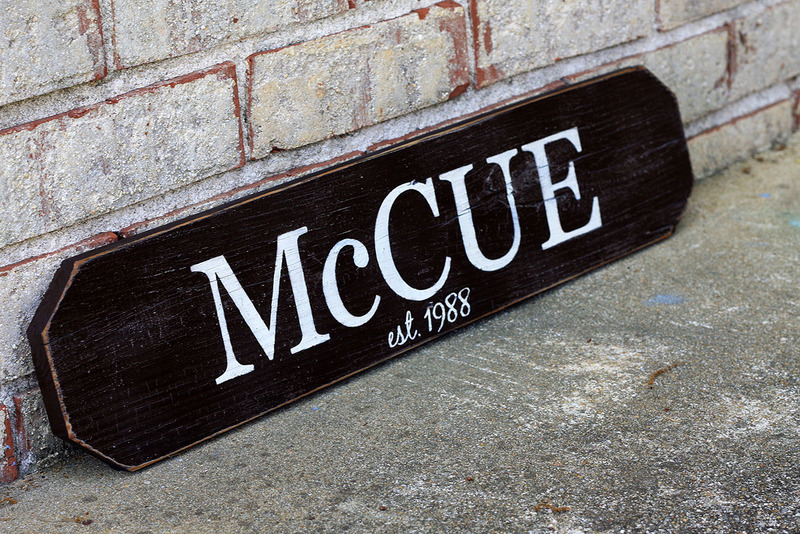 Exceptions include names such as "McRAE", which will include a lowercase "c" for better readability. 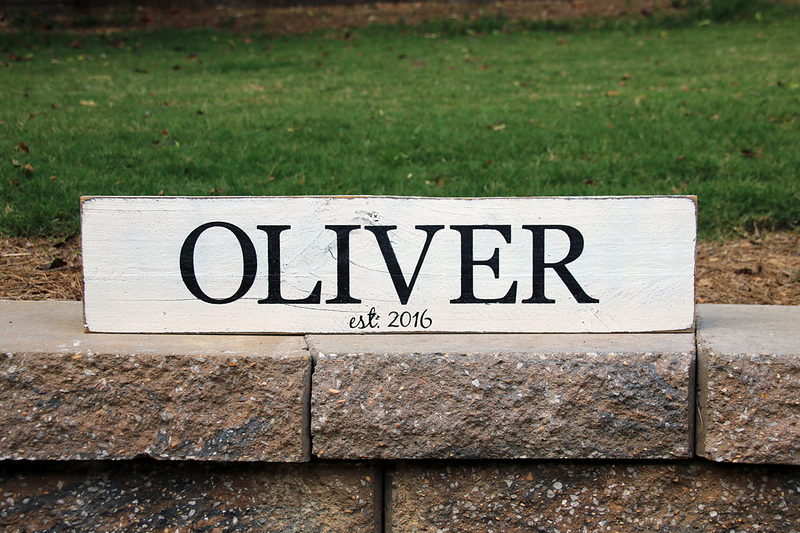 If your name requires a special combination of upper and lowercase letters, please make note of your requests in the comments section of your order, or feel free to contact me if you have questions. How many characters can a Paper Overlay include? 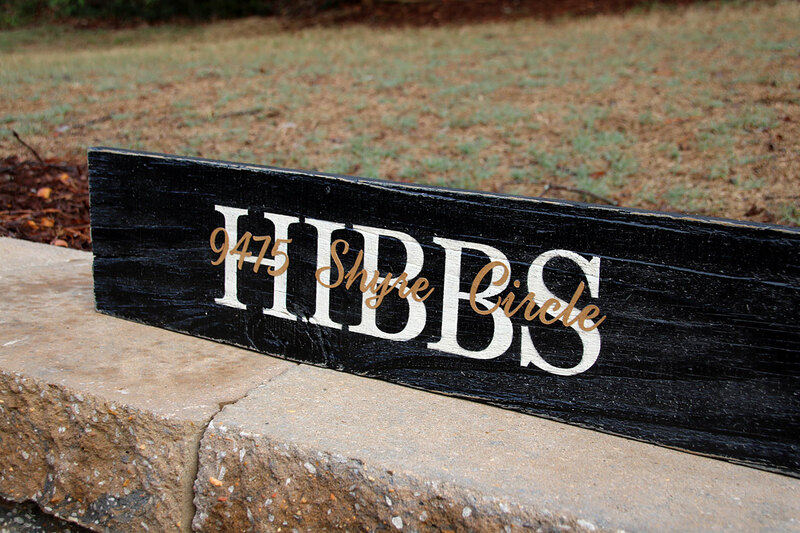 Paper overlays on a 2ft sign can usually include up to five first names or a short quote or phrase. If the names are long, I recommend upgrading to the 3ft sign to allow plenty of room for the overlay lettering. If I have concern about whether your names will fit, I will contact you directly with a proof and option to upgrade or adjust your order. I use a dash (-) between the first names in an overlay if there are more than two, and an ampersand (&) if there are only two names in the overlay. If you would prefer anything other than those options, please make note of your requests in the comments section of your order. Please note: If you have chosen to add a paper overlay to your sign, it is NOT suitable for outdoor display as heat, humidity, and other weather factors will ruin the overlay, and subsequently, the painted sign. Enter the text for the sign (fits most names up to 7 letters, including spaces). Enter the 4-digit year for the "est. DATE" to appear underneath the sign text. A paper overlay can include the first names of the family members, favorite quote or phrase, street address, etc. The text you choose for the paper overlay is cut in a script font out of cardstock and adhered to the sign over the painted text. Enter the text you'd like to lay over the large painted text on your sign. Choose the color of cardstock you would like to use for the paper overlay. Khaki cardstock overlays are available on black, brown, red, and antique white signs. Black cardstock overlays are available for red signs.